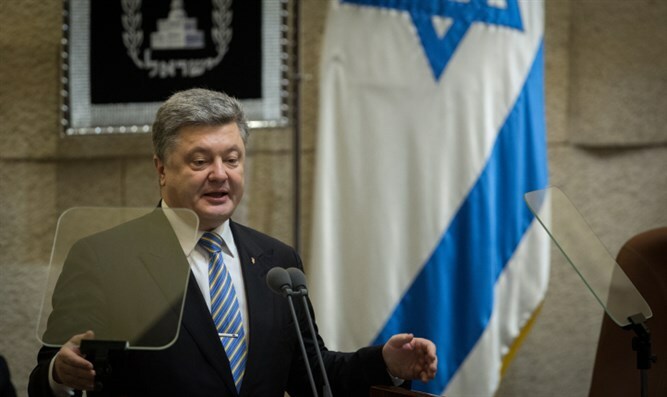 President Petro Poroshenko uses picture of Nazi deportations of Jews in post about Soviet deportations of Ukrainians. Ukrainian President Petro Poroshenko in a post on Twitter added a picture of Jews being deported by Nazis to a text about mass deportations carried out by Soviets against Ukrainians. The apparent gaffe comes amid a polarizing debate in Ukraine over municipalities and other state institutions honoring alleged anti-Semitic nationalists, including one SS officer and collaborators with Nazi Germany whose troops are believed to have killed thousands of Jews. Ukrainian nationalists like Symon Petliura, Stepan Bandera and Roman Shukhevych have had statues unveiled at central locales across Ukraine for their opposition to Russian dominance, despite their actions against Jews. Advocates of the honors said the nationalist groups where Shukhevych and Bandera fought were not anti-Semitic and that they also had Jews in their ranks.